You recite it. But do you understand it? The Apostles' Creed has become so familiar to us that we don't think about what we're saying. Christians from different times, places, and traditions have been united by its eternal truths. We believe them, we recite them, but do we build our lives on them? The fact that so many in the early church died for their faith means they were caught up in something greater than themselves. What were those truths? How did they empower a revolution? How did early church pastors and theologians use the Apostles' Creed as the essential guide to the basics of the Christian life? Ben Myers re-introduces that creed. He shows us what about the Christian faith is so counter-cultural, and what truths embedded in the Apostles' Creed we've come to assume, when really they should amaze us and earn our allegiance unto death. The topic of certitude is much debated today. On one side, commentators such as Charles Krauthammer urge us to achieve "moral clarity." On the other, those like George Will contend that the greatest present threat to civilization is an excess of certitude. To address this uncomfortable debate, Susan Schreiner turns to the intellectuals of early modern Europe, a period when thought was still fluid and had not yet been reified into the form of rationality demanded by the eighteenth and nineteenth centuries. 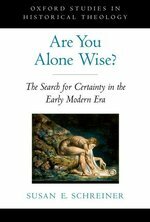 Schreiner argues that Europe in the sixteenth century was preoccupied with concerns similar to ours; both the desire for certainty -- especially religious certainty -- and warnings against certainty permeated the earlier era. Digging beneath overt theological and philosophical problems, she tackles the underlying fears of the period as she addresses questions of salvation, authority, the rise of skepticism, the outbreak of religious violence, the discernment of spirits, and the ambiguous relationship between appearance and reality. In her examination of the history of theological polemics and debates (as well as other genres), Schreiner sheds light on the repeated evaluation of certainty and the recurring fear of deception. Among the texts she draws on are Montaigne's Essays, the mystical writings of Teresa of Avila, the works of Reformation fathers William of Occam, Luther, Thomas Muntzer, and Thomas More; and the dramas of Shakespeare. The result is not a book about theology, but rather about the way in which the concern with certitude determined the theology, polemics and literature of an age. In 1523, in one of the most daring and remarkable events in the history of the Reformation, a woman challenged the Catholic establishment to a public debate. The issue was the persecution of a young Lutheran student in Ingolstadt.Argula von Grumbach's writings on this and many other topics were widely circulated: her first publication alone went through sixteen editions. She addressed the Catholic theologians of Ingolstadt, the Dukes of Bavaria and the Councils of Ingolstadt and Regensburg. She also met with and conducted an extensive correspondence with Luther, Osiander and many of the leading reformers.Professor Peter Matheson here provides translations of all her published works together with introductions. He gives a full biographical account of von Grumbach, analyses her use of Scripture and discusses her role as a woman of the Reformation.The rediscovery of Protestanism's first female theologian and author affords a wealth of new insight into the history of the Reformation; the role of women in Church, state and society; and a woman's use of Scripture, which in many ways anticipates the flowering of feminist theology today. This volume, a part of the Library of Christian Classics series, explores Augustine's classic work on the Trinity and his understanding of Paul, as well as his powers as a preacher. Four centuries in the making, a monumental undertaking and a magnificent achievement, the first definitive Catholic Catechism since the Council of Trent in 1566 details the doctrine, dogma, and the basic tenets of the Church. "A sure and certain standard for the teaching of the faith." -- Pope John Paul II. The historic teachings of four major Christian traditions--Eastern Orthodoxy, Roman Catholicism, Reformation and Union Churches, and Evangelical and Free churches--are set forth here in a comparative framework. 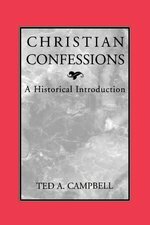 Following a brief historical introduction of each tradition, Ted Campbell provides an extensive overview of the tradition's beliefs on religious authority, God and Christ, human nature and salvation, and church, ministry, and the sacraments. He concludes by considering whether a definable core of Christian teachings cuts across denominational and confessional boundaries. The fact that some who profess to be Christians fall away from the faith has always been an obstacle to God's people, but we are told in the Bible that those who God has called are saved forever. How then are we to understand the saints' perseverance in the Christian life? How are we to view our lives in the light of God's everlasting covenant and Christ's completed work of salvation? What is our motivation to finish the race? John Owen's work The Doctrine of the Saints' Perseverance Explained and Confirmed was originally published in 1654 and this easier-to-read abridgement is still relevant to Christians today. The Christian's Only Comfort is the sermonic exposition of the Heidelberg Catechism by Theodore VanderGroe (17051784), a prominent divine of the Dutch Further Reformation. VanderGroe's exposition of the Heidelberg Catechism could be considered his magnum opus, and in some ways it was esteemed as highly by the godly in the Netherlands as The Christian's Reasonable Service of Wilhelmus Brakel. In this able exposition of the Heidelberg Catechism, we find the unmistakable characteristics of the Dutch Further Reformation: it is steeped in Scripture; it is very pastoral; and it promotes a robust, comprehensive form of Reformed piety. 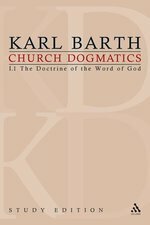 Karl Barth's Church Dogmatics is one of the major theological works of the 20th century. The Swiss-German theologian Karl Barth (1886-1968) was the most original and significant Reformed theologian of the twentieth century. Barth began the Church Dogmatics in 1932 and continued working on its thirteen volumes until the end of his life. Barth's writings continue to guide and instruct the preaching and teaching of pastors and academics worldwide. The English translation was prepared by a team of scholars and edited by G. W. Bromiley and T. F. Torrance and published from 1936. A team of scholars at Princeton Theological Seminary haveÂ now providedÂ the translation of Greek, Latin, Hebrew and French passages into English. The original is presented alongside the English translation. This makes the work more reader friendly and accessible to the growing number of students who do not have a working knowledge of the ancient languages. This new edition with translations is nowÂ available for the first time in individual volumes.